The Thanko USB seat cooler “USBHCU0” is a great way of keeping your seat cool when using PC for a long time at office or at home. How many times especially during summer you have felt uncomfortable sitting for a long time with seat becoming warm. The Thanko USB seat cooler is the answer for this. The USB seat cooler allows cool air to flow to the seat, helping prevent sweaty seat. The seat cooler is connected to the USB port of the PC and cool air is blown from the seat coolers many tiny holes. This mechanism keeps the seat cool and comfortable to sit for a long time. The slim and smart design of the cooling seat system with high-performance extra quiet fan helps to dissipate the heat (air) away from underneath of the seat to cool down the overall temperature of the seat. With plug-and-play USB connection, on/off switch, reliable and easy to be carried around Thanko USB seat cooler USBHCU0 is a must for PC operators. 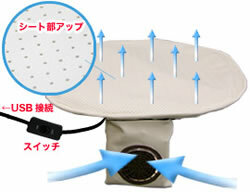 The seat cooler measures 49 x 50.5 cm, and is available for 4,800 Yen ($41).